Silver-Filled is a metal material that is similar in construction to Gold-Filled. It consists of a layer of .925 sterling silver that is bonded to a brass core. The sterling silver layer is 10% by weight of the total material. Our Silver Filled 925/10 has 10% silver content versus 925/20 which only has 5% silver in it. Due to rising sterling silver prices more and more designers are switching to silver filled 925/10 to keep the cost down and still have a great finish piece. 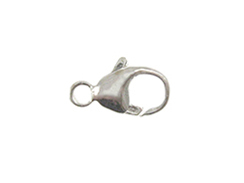 It is a great low-cost alternative to sterling silver.